Be receptive now to situations which lack any depth – when nothing is hidden and everything is seen. The nature of the mind is the nature of the spirit – be willing now to “still” your mind and allow the information to flow freely – trust the deepest core of who you are. Waste no tears on your memories. Examine every thought and do not place your trust in anyone until you have completely analyzed your whole situation. A person of weak character who is lacking in stamina will effect the kind of support you need. Completely review your situation and the people involved. If you find that you are lacking strength – KNOW that you need a deeper commitment. Do not allow yourself to become over emotional now – it will cause you to turn to an irrational line of thought. Your mind is endlessly fruitful – learn how to use this aspect of your equipment or nothing will ever happen. Once you learn how to operate in the mind – you become creative. It is your attitude which creates suffering – change your attitude and the suffering will disappear as your interpretation of the experience will be completely different. You have been passive too long – you are becoming cold and passionless and it has led to weakness, fear of life and fear of other people. You find that you are unable to translate your strong intuition and feeling into action because you are afraid to “open up”. Do not allow yourself to become cold and passionless. Turn towards your passions, towards deep involvement with life and other people in all ways – emotionally, sexually and competitively. Your most precious knowledge is the sense of your “inner” Self. What knowledge are you seeking? What do you need to remember or “discover”? What are you concealing and is it appropriate to do so? Who is seeking your counsel or whose are you seeking? In the first position: This work is already done in you for the most part and you must now help others to their balance. In the fourth position: A heroine/hero worship must have its limits – they must be our guides – not our task masters. In the fifth position: You may have received more information through right-brain, psychic/intuitive input than is helpful for you and your purposes. Consult objective references and/or apply affirmation techniques before acting. In the sixth position: Your emotions and desires may run deep for a short while. Many outside energies vie for your attention, most not worthy of your time. Do not begin major new relationships or creative projects until your heart clears. In the seventh position: Possible confusion about how your mind wants to pursue its interest in these subjects. Be both objective and intuitive in your selection and proceed accordingly. 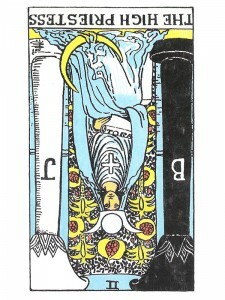 In the eighth position: Inefficient or poor use of feminine energy, a distortion of esoteric or occult traditions. In the ninth position: There may be a block to this feeling, it being unreachable to the extent that you would like or need. As with all positions, the High Priestess here could be a person. Remember also to examine the possible effect of too much or too little. In the tenth position: By grace, there will be a cutting back on the level of feminine energy – a little gift of balancing from the divine, like a spiritual massage session.